Here's a stylish custom poster layout that's great for a family poster with lots of photos in it! 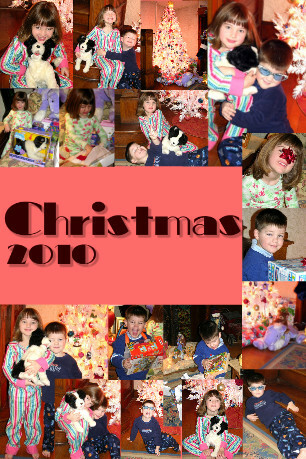 Instead of laying out photos in a random collage, first give the poster a prominent caption ('Christmas 2010' in the sample below). Then layout your photos around the caption. To give your poster a stylish and neat look, make sure all your photos are lined up around the caption. That's really easy to do with the move and resize tools in the Poster Maker. Play around with the sizes of your photos until you get a look that you like. Fill up any left over space with smaller sized photos. This is a great layout for creating a poster from the ton of holiday photos you probably have lying around unused and unseen. Get started by clicking the sample poster above to edit it, or start fresh with a new custom poster in our Poster Maker. For more information about high quality custom poster prints, visit www.postermywall.com.